with high fives, WOWs, and hearty praise. Mt. Helix Academy’s AIM HIGH Resource Center provides a program for students who need additional assistance with just one or two subjects as well as a full day program for students who require intensive instruction to catch up with their age mates. AIM HIGH Resource Center provides a program for students who require more intensive instruction in just one or two basic skills than they can be given in their general education classes. As much as possible, the necessary classes are scheduled at the same time as those subjects are being taught in the general education program. 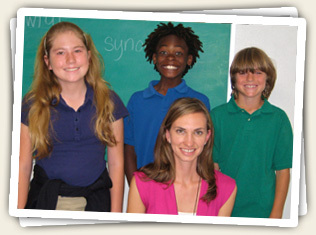 This scheduling allows participating students to join their peers in their other, more successful classes. There’s nothing bigger than the smile of success. AIM HIGH Resource Center’s full-day program is an academic and school skills program designed for good kids who are significantly behind in academics, who may be less than well organized, and who have difficulty with self-management. 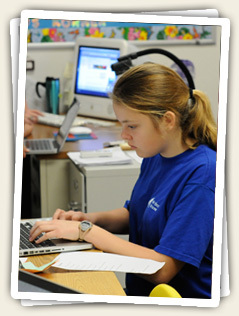 The program provides individualized instruction in all subject areas with the goal for each student to transition to the general education program. Instruction is not limited to academics, but includes direct teaching of self-management, organization skills, social skills, and other skills necessary to be a successful student. Aim High teachers work closely with teachers in the regular program to insure that AIM HIGH students will be successful in their mainstreamed classes. AIM HIGH conducts mainstreaming of its students so well that Mt. Helix Academy received a commendation for its program by the California Department of Education’s Nonpublic School review team. To really succeed, you must aim high. The AIM HIGH program of Mt. Helix Academy is fully certified by the California State Department of Education to serve students with special needs on contract with local school districts. The 210-day AIM HIGH program is appropriate for elementary and Jr. High students who have learning disabilities and/or social interaction difficulties, possibly associated with ADD/ADHD, Asperger Syndrome, or another underlying problem in the mild/moderate range. Students with severe behavior problems are not able to be served in the AIM HIGH program. Please consider another of TIEE’s schools for students who require a Behavior Intervention Plan or Behavior Support Plan for behavior that is aggressive or results in significant property destruction. Designated Instructional Services (DIS), including speech/language therapy, occupational therapy, and behavior intervention planning and implementation, are delivered on a consulting basis only. Consequently, students who have significant speech/language, sensory-motor, or behavior intervention needs and, therefore, require therapy to be delivered by the relevant professional, cannot be served by the AIM HIGH program. Students with significant DIS needs and/or significant behavior challenges should be referred to another of TIEE’s family of schools.